Ever considered installing a grill inside a condo or an apartment complex? Well, if you think that’s not possible, you’d be wrong. It’s more than possible. Grilling inside an apartment or a condo isn’t a new trend. It’s a novel idea, yes, it’s something that a fair number of people continue to indulge in. After all, why wouldn’t they want to? 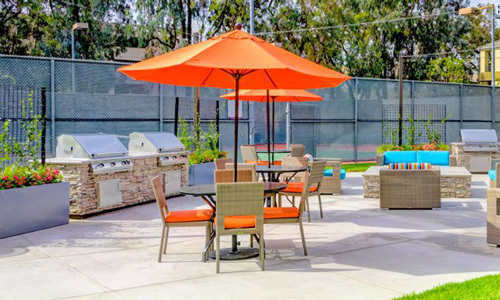 Just because your business is an apartment complex doesn’t mean people have to compromise on being able to barbecue outdoors. All they need to do is just follow a few safety instructions and have a good time. So, as a manager or building owner, make sure your residents or guests are prepared before the whole grilling process begins. Fire is a dangerous thing. Even small kids know that. However, grilling involves fire and you don’t want any accidents happening. So, what’s the solution? Well, it’s quite simple – make sure you educate your residents about the building’s fire codes. Have a discussion with them on the topic. Post signs and placards with fire safety instructions, as well as how to operate the grills. Make sure they learn and follow all safety instructions before beginning the process. This will minimize the chances of an accident occurring, significantly. There seems to be a misconception among many that gas grills are dangerous and the worst option for apartment grilling. However, this is very, very far from the truth. Gas grills, whether they run on propane or natural gas are safe to use. The key to a fun and safe grilling experience lies in following safety rules. If your residents/guests aren’t following safety measures, even cooking in a microwave can go wrong and lead to a fire. Also, there are several benefits to grilling with a gas grill. For starters, they are super convenient. Your residents/guests won’t have to spend hours setting things up like they would with a charcoal grill. Just light the grill and things are ready to get started. Secondly, the grilling process is much faster with gas grills. This is because they heat up quicker and they also cook the food evenly. This is because the heat dispersion with gas grills is far more efficient compared to any other grill. Gas grills also offer more control. This is because most gas grills come with features that let the user control various aspects such as the temperature, cooking time (with a grill timer), and so on. On the other hand, a charcoal grill, for example, cannot be controlled. One has to keep an eye on the food to prevent it from getting burnt. Finally, gas grills are easier to clean. Your tenants/residents won’t need to worry about emptying out charcoal and washing the grill thoroughly. Gas grills produce very little to no ash. So, at most, they might just need to wipe things down a little after everything is done. To make the “apartment grilling” easier for your tenants/residents, get gas grills for apartments/condos/resorts from AEI Corporation. AEI Corporation makes some of the best gas grills on the market. In fact, they have an entire series of gas grills for apartments. Due to their apartment-friendly function and design, these grills are super safe to use. You can also choose from variations such as natural gas grills or commercial pedestal grills. Another major benefit with AEI’s gas grills is that they come with a 60-minute or 1-hour gas flow timer. This timer cuts of gas flow after 60 minutes. This eliminates the risk of gas leakage and the subsequent risk of fire. So, no more need to worry about the grill, accidentally being left on all night.